"Cloudland Canyon 12 mile - Rising and falling in the clouds"
I am a return "newbie" to the sport of trail running after trying a few trail races about 5 years ago. I re-engaged the sport in 2015 and now have set my sights high on trail races and goals for 2016. 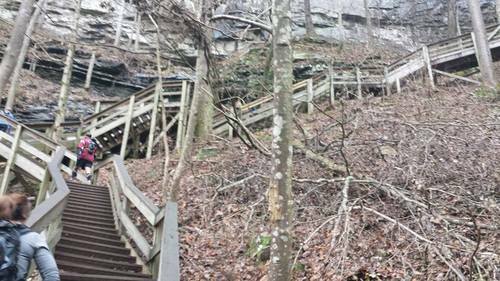 Cloudland Canyon was my first trail race of 2016 and it truly seemed like a race in the clouds. I had no idea what to expect from the race except that I knew from the Cloudland Canyon State park web site and the race web site that we would be running in the canyon and that meant elevation changes - 2100 feet of them! The race is a combination of a short road run that leads to the canyon, a trail run along the West Rim Trail, and then a descent down into the canyon. What goes down must come up and after the descent and a trail run to the aid station a return trip up the canyon stairs was inevitable. The race ended with a 1.25 mile easier run to the finish line that was WELL needed after the descent and ascent shredded my legs. This race is draw dropping. It is a challenge worth taking! The scenery is gorgeous and does not disappoint to any degree. The morning of the race there was low cloud level and serious fog, but views of the canyon were still visible as we closed in off the West Rim trail and running into the canyon was like entering another world. I could have stayed at the waterfalls in the canyon for hours, but the race drew me away. There is one catch though.....Is the race 11 miles long, 12 miles, 13 miles......even though the race entry says 12 miles? The race director is not quite sure and/or just won't say, but instead smiles when you ask him. For his part this race is about challenging yourself and seeing what he wants you to see along the course - the absolute beauty of the canyon. I think the race was a tad bit over 13 miles, but I did not care about the actual distance. I challenged myself, raced, and saw the wonder of nature in this part of the world. I would do it again in a heartbeat. Another great thing about this race is that the Race Director offers an optional dorm bed in the lodge where the race starts via the park service. I agreed to do this along with volunteering for the 50 mile race post my own 12 mile race. This proved to be a the right sleeping choice and a great experience. I made more than a few new friends and waking up 150 ft from the check-in and start was a boon to the day. I can't say I got more rest due to the 50 milers that had to be up at 4 am, but I still garnered more than enough ease in the morning that it was well worth the small cost of the dorm bed. The start and finish of this race is deep within Cloudland Canyon State Park so make sure you take friends and family with you if possible. The 12 mile option is a great alternative for running friends that don't want to run the 50 mile but still want the Cloudland experience. If you are running the 50 mile option take a running crew with you so that they can at least cheer you on at the last check-in. This is crucial for an extra smile to lead you into the last 12 miles and a great way to motivate you to keep on running! I was lucky and blessed enough to go with a current running friend and one of her colleagues who has since become another ultra running friend. They both courageously attempted the 50 mile. We stayed in the dorm together and had a blast the entire trip. Trip cost was low so there was ample time to focus on other parts of the trip on the way home. 1. The food was amazing post race and there was more than enough of it - BBQ and a vegan alternative. All the runners seemed to have their own small pantries of food, but much of it was not needed. This race provides enough. 2. BE PREPARED for any weather scenario. Last year the temps were in the low teens and did not get much higher throughout the day. 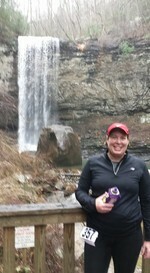 Cloudland Canyon was frozen! This YEAR the temps were in the upper forties at the start and the air was wet with a slight drizzle/light rain. Perfect running temps. Sat night post race we had pouring down rain and snow the next morning as temps dropped to freezing. Be prepared to run in any kind of weather. 3. This is not a big swag race and really should not be. There is a race shirt and the all important pub glass to fill from the keg at the finish of both races, BUT the swag is not why you run this race - the experience/challenge is and the swag is enough.